Secretary-General Ban Ki-moon speaks at event for the Every Woman, Every Child initiative. Secretary-General Ban Ki-moon called today on business leaders attending the World Economic Forum in Davos, Switzerland, to increase their investment in women’s education and health to ensure their well-being and encourage their participation in the world economy. “Investing in the health of women and girls is the right thing to do and the smart thing to do for national economies and global stability,” Mr. Ban said at an event organized by the Every Woman Every Child initiative, a global effort launched in 2010 to mobilize and intensify global action to save the lives of 16 million women and children and improve the lives of millions more. While in Davos, Mr. Ban held several meetings on the margins of the Forum with officials including the President of the Swiss Confederation Eveline Widmer-Schlumpf, the Prime Minister of Denmark Helle Thorning-Schmidt, and Brazil’s Foreign Minister Antonio de Aguilar Patriota with whom he discussed the upcoming UN Sustainable Development Conference (Rio+20) among other topics. 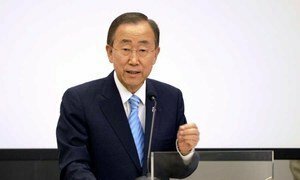 Secretary-General Ban Ki-moon urged developing countries today to not lose momentum in their ongoing efforts to improve women and children’s health and warned there is still much to be done to tackle this issue.